Menu UtamaUntuk klienPendidikanFAQWhat types of pending orders are there? What types of pending orders are there? A pending order is the client's order to buy or sell a financial instrument at the specified price in the future. Buy Limit — to buy, when the future "Ask" price is equal to the specified value. The current price level is higher than the value of the placed order. Execution of this type of order means that the transaction will be made at the price specified in the order or at the price that is lower. Orders of this type are usually placed in anticipation that the instrument price, having fallen to a certain level, will increase. 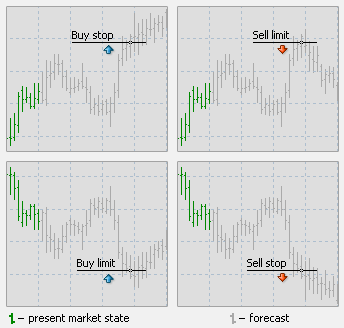 Buy Stop — to buy, when the future "Ask" price is equal to the specified value. The current price level is lower than the value of the placed order. Execution of this type of order means that the transaction will be made at the price existing at the moment when the order is executed, which may be different from the price specified in the order. Orders of this type are usually placed in anticipation that the instrument price, having reached a certain level, will keep increasing. Sell Limit — to sell, when the future "Bid" price is equal to the specified value. The current price level is lower than the value of the placed order. Execution of this type of order means that the transaction will be made at the price specified in the order or at the price that is higher. Orders of this type are usually placed in anticipation that the instrument price, having rising to a certain level, will decrease. Sell Stop — to sell, when the future "Bid" price is equal to the specified value. The current price level is higher than the value of the placed order. Execution of this type of order means that the transaction will be made at the price existing at the moment when the order is executed, which may be different from the price specified in the order. Orders of this type are usually placed in anticipation that the instrument price, having reached a certain level, will keep decreasing.